I am sometimes unsure about Archbishop Rowan Williams, but his Christmas message to the Anglican Communion has increased my respect for him. 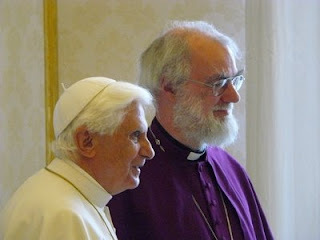 Yes, I know he is wrong about women priests and bishops - tragically wrong, and he has had a bad track record on the question of homosexual clergy, but there have been other, more positive signs and developments, like his recent visit to Lourdes where he expressed his own acceptance of the apparitions and the shrine. His regard for Pope Benedict is well known and should be a sign of hope for all those who long for unity (about which more later). His message speaks about the importance of children and specifically mentions the respect we owe to the unborn. God came to us in the form of a baby and "chose to show Himself to us in complete human life, telling us that every stage of existence, from conception to maturity, and even death, was in principle capable of telling us something about God". He speaks about the reverence we owe to "human beings in every condition, at every stage of existence. This is why" he says, "we cannot regard unborn children as less than members of the human family, why those with disabilities or deprivations have no less claim upon us than anyone else, why we try to make loving sense of human life when it is near its end and we can hardly see any signs left of freedom or thought"
Speaking of conception as he does, it seems to me that he is opening the door to those in his communion who are arguing for the protection of the embryo. The Archbishop is no fool; he is aware of the recent statement from the Holy See on human dignity. This message is well-timed; he knows what he is doing and, in my view, the picture above shows more than a friendly association. There is something here which merits attention.